Cut steak in half horizontally, cutting almost but not completely through one long side; open steak to make 1 large 1/2-inch-thick piece. If necessary, pound steak gently to make of even thickness. Arrange onion, bell pepper, tomatoes, garlic and oregano evenly over steak, leaving 1 inch at one narrow end free of vegetables. Starting with other narrow end and rolling toward end free of vegetables, roll up steak. Fasten with toothpicks or secure with string. 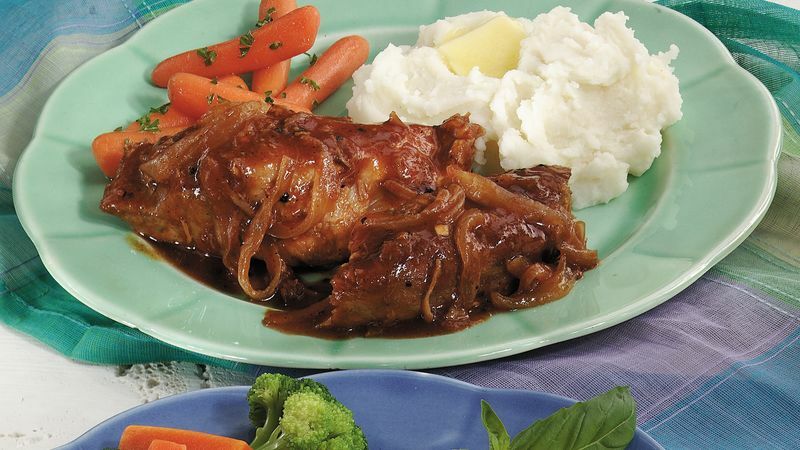 Place steak roll in 4- to 6-quart slow cooker. In medium bowl, combine gravy, wine and pepper; mix well. Pour over steak roll. Cover; cook on low setting for 4 to 6 hours. About 10 minutes before serving, remove steak roll from slow cooker; place on serving platter. Cover with foil. In small bowl, blend water and flour until smooth. Stir into juices in slow cooker. Increase heat setting to high; cover and cook an additional 10 minutes or until thickened. Cut steak roll into slices; sprinkle with basil. Serve steak roll slices with gravy mixture. Be sure to use dry sun-dried tomatoes instead of the oil-packed variety. The dry sun-dried tomatoes soak up the juices and become tender during cooking. Look for them in the produce department of your supermarket near the other dried foods.